Enter our Elite Contest for a chance to win an amazing dining experience for two. Valued at $200, this absolutely care-free evening is provided by our friends from Barrique Kitchen & Wine Bar and Friends DD. 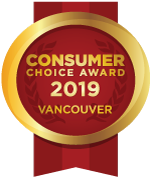 In celebration of our success at the Consumer Choice Awards 2018, we are giving away this fantastic dining and wining experience at Barrique Kitchen & Wine Bar, and a ride from Friends DD. Imagine a relaxing evening with a great company while Chef, Carel prepares a delicious three course meal with wine pairings. All you have to do is sit back and have fun! Carel Meyburg is a world-traveling Chef who has learned many different styles of cooking. With over 10 years of industry experience, Carel is currently pouring his passion for culinary arts into the newly opened Barrique Kitchen & Wine Bar in White Rock, BC. Carel also specializes in private fine dining with focus on Thai, Indian, and Italian cuisine. Indeed, Carel’s cooking shows the melody of his travels. Friends DD is a designated driving service covering all of Greater Vancouver and the Fraser Valley. Friends DD will pick you up from anywhere within their service area and drive you home safely in your vehicle. Contest rules: ***Prize must me redeemed within 4 weeks after the winner’s notification. Prize is not transferable, not redeemable for cash. Total of one prize in the contest. One entry per contestant.